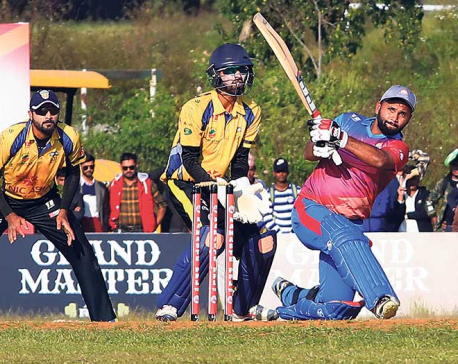 POKHARA, Nov 7: A mixture of drives, cuts and pull shots by Indian batting maestro Ravi Inder Singh powered Pokhara Paltan to first ever Pokhara Premier League (PPL) trophy defeating Chitwan Rhinos by three wickets in the final match played at the Rangshaala Cricket Ground, Pokhara on Tuesday. The left-handed batsman scored 90 runs off 58 deliveries including 13 boundaries and three sixes. 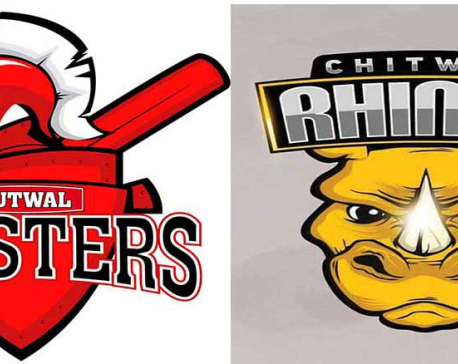 Punjab’s first-class cricketer Ravi Inder displayed a varied array of shots during his batting master-class as Rhinos were outplayed in the one-sided final witnessed by host of political leaders like former prime minister Pushpa Kamal Dahal and former health minister Gagan Thapa. 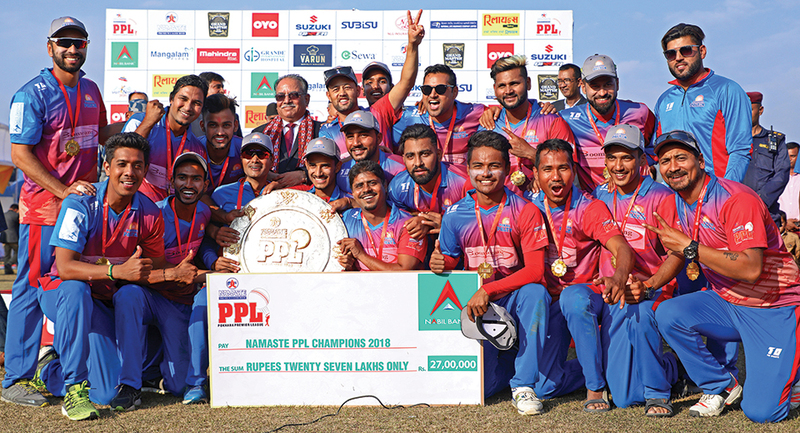 The left-handed batsman was solid throughout the chase as he firmly held on an end and build partnerships of 61 runs with Aasif Shiekh, 33 runs with Muhammad Naveed and a match winning 50 runs with skipper Sharad Vesawkar for the inaugural trophy of the latest T20 franchise competition of Nepal. Vesawkar scored 22 runs from 23 deliveries including two boundaries. Bhuvan Karki picked two wickets in the 18th over dismissing Vesawkar and Rohit Kumar Paudel for a duck to entertain whatever little chances Rhinos had in the match but was soon killed off by Ravi Inder who smashed a six off the fifth delivery of the over from a looped up delivery. However, Ravi Inder soon lost his wicket to a short ball from skipper Khadka in the penultimate over. Aarif Sheikh completed the miscued catch. UAE pace bowler Muhammad Naveed have a reputation of scoring big hits as it was in full flow against Rhinos in the final. Naveed scored 25 runs from 14 deliveries which included a four and three massive sixes. Naveed was dismissed by Sunny Patel mistiming on the offside as Anil Kumar Sah hold on to the catch of the match at the deep cover boundary. Kushal Bhurtel was caught behind by the wicket-keeper AakashThapa off a miscued late cut shot off Karan KC in the first over. Similarly, Aasif Sheikh, who looked good for his 12 runs at the crease, was ran out by Sunny Patel after Ravi Inder Singh denied a quick single as Aasif could not get back to his crease on time. Khadka, Karan and Sunny Patel shared a wicket each in the innings. Earlier, Pokhara Paltan won the toss and invited Rhinos to bat first which looked a pitch assisting seam bowlers and Paltan having three of them. UAE premium pace bowler Muhammad Naveed started with couple of economical overs as Lalit Rajbanshi, the left-arm spinner, outfoxed inform Hari Shankar Shah for eight runs from 12 deliveries. Binod Bhandari completed a quick stumping. Naveed came back late in the innings to complete his spell and dismissed Anil Kumar Sah for 37 runs. Sah was deprived of strike in the middle overs and faced 38 deliveries smashing three boundaries and a six. Both, Naveed and Rajbanshi, bowled four overs each and conceded identical 18 runs and picked up a wicket each in their respective bowling spells. Skipper Khadka smashed a half-century and Indian allrounder Sunny Patel amassed a timely cameo in the slog overs to propel Rhinos to 160 runs for the loss of five wickets at the end of 20 overs. Khadka hit nine boundaries collecting 51 runs from 37 deliveries during his stay at the crease. Paltan fast bowler Rashid Khan, who has impressed throughout the tournament, drew three edges from first four deliveries he bowled at Khadka but the batsman survived every time and went on to score a crucial half-century in the final of the PPL. Rashid ended his spell with no wickets and conceding 31 runs from his four overs. The impetus was provided by the right handed batsman from India, Sunny Patel. He scored runs at a strike rate of 204. Patel smashed four sixes and three sixes during his 21-ball stay and scored 43 runs. Aarif Sheikh remained not out on 14 runs with a six from 11 deliveries. Paltan seam bowler Krishna Karki bowled an excellent last over picking up the wickets of Patel and Karan KC. Both catches were taken by Kushal Bhurtel at the boundary line. Karki concede 36 runs from his four overs and picked up two wickets in the match. The leg-spinner Bikram Bhusal was the most expensive bowler of the innings conceding 52 runs from his four overs. This was most conceded by a bowler in a four over spell in PPL. Bhusal relieved Daniel Lawrence off the burden who had earlier conceded 51 runs from his four overs representing Expert Dhangadhi Blues during the group stage. 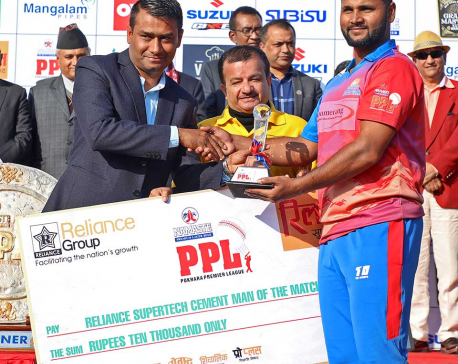 Rhinos skipper Khadka was all praise for Ravi Inder during the post-match presentation. “We were 10-15 runs short. I think Ravi played innings of a lifetime and he took the match away from us singlehandedly. Also, hats-off to the team winning every match till today as each match was like a final after losing first two games,” said Khadka. Ravi Inder Singh was adjudged man of the final whereas Sunny Patel grabbed the man of the tournament trophy. Likewise, LalitRajbanshi was awarded with the most valuable player of the tournament. Kathmandu Royals’ Gaurav Tomar was given best batsman and Karan KC took away the best bowler award from the tournament. Similarly, young fast bowler Rashid Khan was bestowed as emerging player of the tournament.